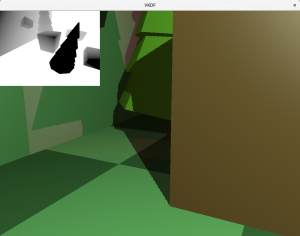 The last time I talked about my driver work was to announce the implementation of the shaderInt16 feature for the Anvil Vulkan driver back in May, and since then I have been working on VK_KHR_shader_float16_int8, a new Vulkan extension recently announced by the Khronos group, for which I have just posted initial patches in mesa-dev supporting Broadwell and later Intel platforms. As you probably guessed by the name, this extension enables Vulkan to consume SPIR-V shaders that use of Float16 and Int8 types in arithmetic operations, extending the functionality included with VK_KHR_16bit_storage and VK_KHR_8bit_storage, which was limited to load/store operations. In theory, applications that do not need the range and precision of regular 32-bit floating point and integers, can use these new types to improve performance by increasing ALU throughput and reducing register pressure, which in some platforms can also lead to improved parallelism. In the case of the Intel platforms initial testing done by Intel suggests that better ALU throughput is expected when issuing half-float instructions. Lower register pressure is also expected, at least for SIMD16 fragment and compute shaders, where we can pack all 16-channels worth of half-float data into a single GPU register, which could significantly improve performance for shaders that would otherwise need to spill registers to memory. Another neat thing is that while VK_KHR_shader_float16_int8 is a Vulkan extension, its implementation is mostly API agnostic, so most of the work we did here should also help us have a proper mediump implementation for GLSL ES shaders in the future. There are a few caveats to consider as well though: on some hardware platforms smaller bit-sizes have certain hardware restrictions that may lead to emitting worse shader code in some scenarios, and generally, Mesa’s compiler infrastructure (and the Intel compiler backend in particular) have a long history of being 32-bit only, so there are parts of the compiler stack that still work better for 32-bit code. 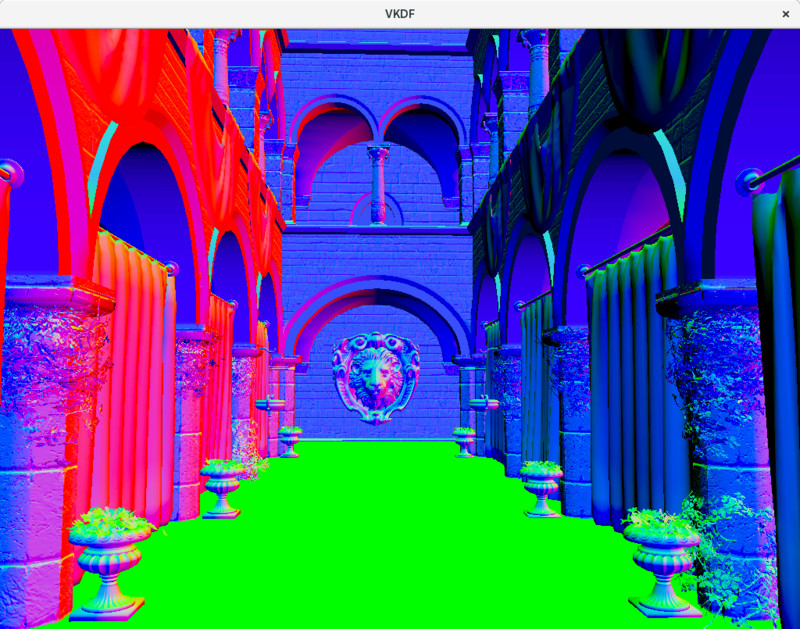 Because VK_KHR_shader_float16_int8 is a brand new feature, we don’t really have any real world use cases yet. This is on top of the fact that Mesa’s compiler backends have been mostly (or exclusively) 32-bit aware until now (and more recently 64-bit too), so going forward I would expect a lot of focus on making our compiler be as robust (and optimal) for 16-bit code as it is for 32-bit code. While we are already aware of a few areas where we can do better and I am currently working on addressing a few of these, one of the major limiting factors we have at the moment is the fact that the only source of 16-bit shaders available to us is the Khronos CTS, which due to its particular motivation, is very different from real world shader workloads and it is not a valid source material to drive compiler optimization work. Unfortunately, it might take some time until we start seeing applications using these new features, so in the meantime we will need to find other ways to drive further work in this area, and I think our best option here might be GLSL ES’s mediump and lowp qualifiers. GLSL ES mediump and lowp qualifiers have been around for a long time but they are only defined as hints to the shader compiler that lower precision is acceptable and we have never really used them to emit half-float code. Thankfully, Topi Pohjolainen from Intel has been working on this for a while, which would open up a much better scenario for improving our 16-bit compiler paths, so this is something I am really looking forward to. Finally, as I say above, we could could definitely use more testing and feedback from real world use cases, so if you decide to use this feature in your next project and you hit any bugs, please be sure to file them in Bugzilla so we can continue to improve our implementation. The Vulkan specification includes a number of optional features that drivers may or may not support, as described in chapter 30.1 Features. Application developers can query the driver for supported features via vkGetPhysicalDeviceFeatures() and then activate the subset they need in the pEnabledFeatures field of the VkDeviceCreateInfo structure passed at device creation time. It is probably relevant to highlight that this Vulkan capability also requires the SPIR-V Int16 capability, which basically means that the driver’s SPIR-V compiler backend can actually digest SPIR-V shaders that declare and use 16-bit integers, and which is really the core of the functionality exposed by the Vulkan feature. Ideally, shaderInt16 would increase the overall throughput of integer operations in shaders, leading to better performance when you don’t need a full 32-bit range. It may also provide better overall register usage since you need less register space to store your integer data during shader execution. It is important to remark, however, that not all hardware platforms (Intel or otherwise) may have native support for all possible types of 16-bit operations, and thus, some of them might still need to run in 32-bit (which requires injecting type conversion instructions in the shader code). For Intel platforms, this is the case for operations associated with integer division. From the point of view of the driver, this is the first time that we generally exercise lower bit-size data types in the driver compiler backend, so if you find any bugs in the implementation, please file bug reports in bugzilla! The VK_KHR_16bit_storage extension allows use of 16-bit types in shader input and output interfaces, and push constant blocks. This extension introduces several new optional features which map to SPIR-V capabilities and allow access to 16-bit data in Block-decorated objects in the Uniform and the StorageBuffer storage classes, and objects in the PushConstant storage class. 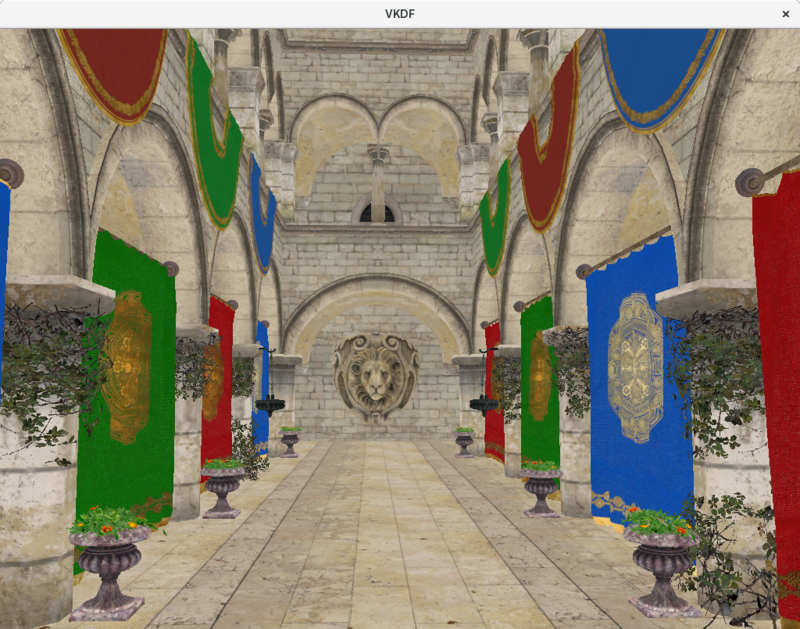 This extension allows 16-bit variables to be declared and used as user-defined shader inputs and outputs but does not change location assignment and component assignment rules. While the shaderInt16 capability provides the means to operate with 16-bit integers inside a shader, the VK_KHR_16bit_storage extension provides developers with the means to also feed shaders with 16-bit integer (and also floating point) input data, such as Uniform/Storage Buffer Objects or Push Constants, from the applications side, plus, it also gives the opportunity for linked shader stages in a graphics pipeline to consume 16-bit shader inputs and produce 16-bit shader outputs. VK_KHR_16bit_storage and shaderInt16 should be seen as two parts of a whole, each one addressing one part of a larger problem: VK_KHR_16bit_storage can help reduce memory bandwith for Uniform and Storage Buffer data accessed from the shaders and / or optimize Push Constant space, of which there are only a few bytes available, making it a precious shader resource, but without shaderInt16, shaders that are fed 16-bit input data are still required to convert this data to 32-bit internally for operation (and then back again to 16-bit for output if needed). Likewise, shaders that use shaderInt16 without VK_KHR_16bit_storage can only operate with 16-bit data that is generated inside the shader, which largely limits its usage. Both together, however, give you the complete functionality. We are very happy to continue expanding the feature set supported in Anvil and we look forward to seeing application developers making good use of shaderInt16 in Vulkan to improve shader performance. As noted above, this is the first time that we fully enable the shader compiler backend to do general purpose operations on lower bit-size data types and there might be things that we can still improve or optimize. If you hit any issues with the implementation, please contact us and / or file bug reports so we can continue to improve the implementation. This screenshot was captured on my Intel Kabylake laptop, running on the Intel Mesa Vulkan driver (Anvil). I have been thinking about writing post about this for some time, but given that there are multiple features involved I wasn’t sure how to scope it. Eventually I decided to write a “frame analysis” post where I describe, step by step, all the render passes involved in the production of the single frame capture showed at the top of the post. I always enjoyed reading this kind of articles so I figured it would be fun to write one myself and I hope others find it informative, if not entertaining. To avoid making the post too dense I won’t go into too much detail while describing each render pass, so don’t expect me to go into the nitty-gritty of how I implemented Screen Space Ambient Occlussion for example. Instead I intend to give a high-level overview of how the various features implemented in the demo work together to create the final result. I will provide screenshots so that readers can appreciate the outputs of each step and verify how detail and quality build up over time as we include more features in the pipeline. Those who are more interested in the programming details of particular features can always have a look at the Vulkan source code (link available at the bottom of the article), look for specific tutorials available on the Internet or wait for me to write feature-specifc posts (I don’t make any promises though!). If you’re interested in going through with this then grab a cup of coffe and get ready, it is going to be a long ride! This is the only step in this discussion that runs on the CPU, and while optional from the point of view of the result (it doesn’t affect the actual result of the rendering), it is relevant from a performance point of view. Prior to rendering anything, in every frame, we usually want to cull meshes that are not visible to the camera. This can greatly help performance, even on a relatively simple scene such as this. This is of course more noticeable when the camera is looking in a direction in which a significant amount of geometry is not visible to it, but in general, there are always parts of the scene that are not visible to the camera, so culling is usually going to give you a performance bonus. In large, complex scenes with tons of objects we probably want to use more sophisticated culling methods such as Quadtrees, but in this case, since the number of meshes is not too high (the Sponza model is slightly shy of 400 meshes), we just go though all of them and cull them individually against the camera’s frustum, which determines the area of the 3D space that is visible to the camera. The way culling works is simple: for each mesh we compute an axis-aligned bounding box and we test that box for intersection with the camera’s frustum. If we can determine that the box never intersects, then the mesh enclosed within it is not visible and we flag it as such. Later on, at rendering time (or rather, at command recording time, since the demo has been written in Vulkan) we just skip the meshes that have been flagged. The algorithm is not perfect, since it is possible that an axis-aligned bounding box for a particular mesh is visible to the camera and yet no part of the mesh itself is visible, but it should not affect a lot of meshes and trying to improve this would incur in additional checks that could undermine the efficiency of the process anyway. Since in this particular demo we only have static geometry we only need to run the culling pass when the camera moves around, since otherwise the list of visible meshes doesn’t change. If dynamic geometry were present, we would need to at least cull dynamic geometry on every frame even if the camera stayed static, since dynamic elements may step in (or out of) the viewing frustum at any moment. This is an optional stage, but it can help performance significantly in many cases. The idea is the following: our GPU performance is usually going to be limited by the fragment shader, and very specially so as we target higher resolutions. In this context, without a depth pre-pass, we are very likely going to execute the fragment shader for fragments that will not end up in the screen because they are occluded by fragments produced by other geometry in the scene that will be rasterized to the same XY screen-space coordinates but with a smaller Z coordinate (closer to the camera). This wastes precious GPU resources. One way to improve the situation is to sort our geometry by distance from the camera and render front to back. With this we can get fragments that are rasterized from background geometry quickly discarded by early depth tests before the fragment shader runs for them. Unfortunately, although this will certainly help (assuming we can spare the extra CPU work to keep our geometry sorted for every frame), it won’t eliminate all the instances of the problem in the general case. Also, some times things are more complicated, as the shading cost of different pieces of geometry can be very different and we should also take this into account. For example, we can have a very large piece of geometry for which some pixels are very close to the camera while some others are very far away and that has a very expensive shader. If our renderer is doing front-to-back rendering without any other considerations it will likely render this geometry early (since parts of it are very close to the camera), which means that it will shade all or most of its very expensive fragments. However, if the renderer accounts for the relative cost of the shader execution it would probably postpone rendering it as much as possible, so by the time it actually renders it, it takes advantage of early fragment depth tests to avoid as many of its expensive fragment shader executions as possible. Using a depth-prepass ensures that we only run our fragment shader for visible fragments, and only those, no matter the situation. The downside is that we have to execute a separate rendering pass where we render our geometry to the depth buffer so that we can identify the visible fragments. This pass is usually very fast though, since we don’t even need a fragment shader and we are only writing to a depth texture. The exception to this rule is geometry that has opacity information, such as opacity textures, in which case we need to run a cheap fragment shader to identify transparent pixels and discard them so they don’t hit the depth buffer. In the Sponza model we need to do that for the flowers or the vines on the columns for example. The picture shows the output of the depth pre-pass. Darker colors mean smaller distance from the camera. That’s why the picture gets brighter as we move further away. Now, the remaining passes will be able to use this information to limit their shading to fragments that, for a given XY screen-space position, match exactly the Z value stored in the depth buffer, effectively selecting only the fragments that will be visible in the screen. We do this by configuring the depth test to do an EQUAL test instead of the usual LESS test, which is what we use in the depth-prepass. In this particular demo, running on my Intel GPU, the depth pre-pass is by far the cheapest of all the GPU passes and it definitely pays off in terms of overall performance output. In this demo we have single source of light produced by a directional light that simulates the sun. You can probably guess the direction of the light by checking out the picture at the top of this post and looking at the direction projected shadows. I already covered how shadow mapping works in previous series of posts, so if you’re interested in the programming details I encourage you to read that. Anyway, the basic idea is that we want to capture the scene from the point of view of the light source (to be more precise, we want to capture the objects in the scene that can potentially produce shadows that are visible to our camera). With that information, we will be able to inform out lighting pass so it can tell if a particular fragment is in the shadows (not visible from our light’s perspective) or in the light (visible from our light’s perspective) and shade it accordingly. From a technical point of view, recording a shadow map is exactly the same as the depth-prepass: we basically do a depth-only rendering and capture the result in a depth texture. The main differences here are that we need to render from the point of view of the light instead of our camera’s and that this being a directional light, we need to use an orthographic projection and adjust it properly so we capture all relevant shadow casters around the camera. In the image above we can see the shadow map generated for this frame. Again, the brighter the color, the further away the fragment is from the light source. The bright white area outside the atrium building represents the part of the scene that is empty and thus ends with the maximum depth, which is what we use to clear the shadow map before rendering to it. You can see how in the 1024×1024 version there are some missing shadows for the vines on the columns and generally blurrier shadows (when not also slightly distorted) everywhere else. In deferred rendering we capture various attributes of the fragments produced by rasterizing our geometry and write them to separate textures that we will use to inform the lighting pass later on (and possibly other passes). What we do here is to render our geometry normally, like we did in our depth-prepass, but this time, as we explained before, we configure the depth test to only pass fragments that match the contents of the depth-buffer that we produced in the depth-prepass, so we only process fragments that we now will be visible on the screen. It is important to be very careful when defining what we store in the GBuffer: since we are rendering to multiple screen-sized textures, this pass has serious bandwidth requirements and therefore, we should use texture formats that give us the range and precision we need with the smallest pixel size requirements and avoid storing information that we can get or compute efficiently through other means. This is particularly relevant for integrated GPUs that don’t have dedicated video memory (such as my Intel GPU). In the demo, I do lighting in view-space (that is the coordinate space used takes the camera as its origin), so I need to work with positions and vectors in this coordinate space. One of the parameters we need for lighting is surface normals, which are conveniently stored in the GBuffer, but we will also need to know the view-space position of the fragments in the screen. To avoid storing the latter in the GBuffer we take advantage of the fact that we can reconstruct the view-space position of any fragment on the screen from its depth (which is stored in the depth buffer we rendered during the depth-prepass) and the camera’s projection matrix. I might cover the process in more detail in another post, for now, what is important to remember is that we don’t need to worry about storing fragment positions in the GBuffer and that saves us some bandwidth, helping performance. Here we see the normalized normal vectors for each fragment in view-space. This means they are expressed in a coordinate space in which our camera is at the origin and the positive Z direction is opposite to the camera’s view vector. Therefore, we see that surfaces pointing to the right of our camera are red (positive X), those pointing up are green (positive Y) and those pointing opposite to the camera’s view direction are blue (positive Z). It should be mentioned that some of these surfaces use normal maps for bump mapping. These normal maps are textures that provide per-fragment normal information instead of the usual vertex normals that come with the polygon meshes. This means that instead of computing per-fragment normals as a simple interpolation of the per-vertex normals across the polygon faces, which gives us a rather flat result, we use a texture to adjust the normal for each fragment in the surface, which enables the lighting pass to render more nuanced surfaces that seem to have a lot more volume and detail than they would have otherwise. All the extra detail in the columns is the sole result of the bump mapping technique. Here we have the diffuse color of each fragment in the scene. This is basically how our scene would look like if we didn’t implement a lighting pass that considers how the light source interacts with the scene. Naturally, we will use this information in the lighting pass to modulate the color output based on the light interaction with each fragment. This is similar to the diffuse texture, but here we are storing the color (and strength) used to compute specular reflections. Similarly to normal textures, we use specular maps to obtain per-fragment specular colors and intensities. This allows us to simulate combinations of more complex materials in the same mesh by specifying different specular properties for each fragment. The image shows visible specular reflections in the yellow embroidery decorations of the cloth (on the bottom-left) that are not present in the textile segment (the blue region of the cloth). Finally, we store fragment positions in the coordinate space of the light source so we can implement shadows in the lighting pass. This image may be less intuitive to interpret, since it is encoding space positions from the point of view of the sun rather than physical properties of the fragments. We will need to retrieve this information for each fragment during the lighting pass so that we can tell, together with the shadow map, which fragments are visible from the light source (and therefore are directly lit by the sun) and which are not (and therefore are in the shadows). Again, more detail on how that process works, step by step and including Vulkan source code in my series of posts on that topic. 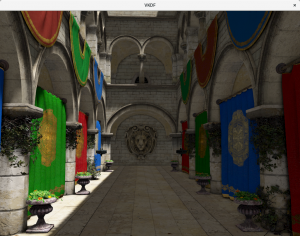 With the information stored in the GBuffer we can now also run a screen-space ambient occlusion pass that we will use to improve our lighting pass later on. Comparing the images above should illustrate the benefits of the SSAO technique. For example, look at the folds in the blue curtains on the right side of the images, without SSAO, we barely see them because the lighting is too flat across all the pixels in the curtain. Similarly, thanks to SSAO we can create shadowed areas from ambient light alone, as we can see behind the cloths that hang from the upper floor of the atrium or behind the vines on the columns. In that image, white tones represent strong light intensity and black tones represent low light intensity produced by occlusion from nearby geometry. In our lighting pass we will source from this texture to obtain per-fragment ambient occlusion information and modulate the ambient term accordingly, bringing the additional volume showcased in the image above to the final rendering. Finally, we get to the lighting pass. Most of what we showcased above was preparation work for this. The lighting pass mostly goes as I described in my lighting and shadows series, only that since we are doing deferred rendering we get our per-fragment lighting inputs by reading from the GBuffer textures instead of getting them from the vertex shader. Basically, the process involves retrieving diffuse, ambient and specular color information from the GBuffer and use it as input for the lighting equations to produce the final color for each fragment. We also sample from the shadow map to decide which pixels are in the shadows, in which case we remove their diffuse and specular components, making them darker and producing shadows in the image as a result. 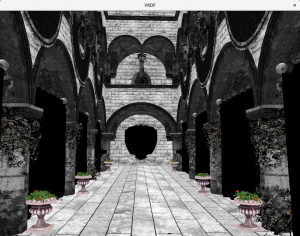 We also use the SSAO output to improve the ambient light term as described before, multipliying the ambient term of each fragment by the SSAO value we computed for it, reducing the strength of the ambient light for pixels that are surrounded by nearby geometry. The lighting pass is also where we put bump mapping to use. Bump mapping provides more detailed information about surface normals, which the lighting pass uses to simulate more complex lighting interactions with mesh surfaces, producing significantly enhanced results, as I showcased earlier in this post. After the lighting pass we run a number of post-processing passes, of which tone mapping is the first one. The idea behind tone mapping is this: normally, shader color outputs are limited to the range [0, 1], which puts a hard cap on our lighting calculations. Specifically, it means that when our light contributions to a particular pixel go beyond 1.0 in any color component, they get clamped, which can distort the resulting color in unrealistic ways, specially when this happens during intermediate lighting calculations (since the deviation from the physically correct color is then used as input to more computations, which then build on that error). To work around this we do our lighting calculations in High Dynamic Range (HDR) which allows us to produce color values with components larger than 1.0, and then we run a tone mapping pass to re-map the result to the [0, 1] range when we are done with the lighting calculations and we are ready for display. The nice thing about tone mapping is that it gives the developer control over how that mapping happens, allowing us to decide if we are interested in preserving more detail in the darker or brighter areas of the scene. The material used to render the floor is reflective, which means that we can see the reflections of the surrounding environment on it. There are various ways to capture reflections, each with their own set of pros and cons. When I implemented my OpenGL terrain rendering demo I implemented water reflections using “Planar Reflections”, which produce very accurate results at the expense of requiring to re-render the scene with the camera facing in the same direction as the reflection. Although this can be done at a lower resolution, it is still quite expensive and cumbersome to setup (for example, you would need to run an additional culling pass), and you also need to consider that we need to do this for each planar surface you want to apply reflections on, so it doesn’t scale very well. In this demo, although it is not visible in the reference screenshot, I am capturing reflections from the floor sections of both stories of the atrium, so the Planar Reflections approach might have required me to render twice when fragments of both sections are visible (admittedly, not very often, but not impossible with the free camera). So in this particular case I decided to experiment with a different technique that has become quite popular, despite its many shortcomings, because it is a lot faster: Screen Space Reflections. As all screen-space techniques, the technique uses information already present in the screen to capture the reflection information, so we don’t have to render again from a different perspective. This leads to a number of limitations that can produce fairly visible artifacts, specially when there is dynamic geometry involved. Nevertheless, in my particular case I don’t have any dynamic geometry, at least not yet, so while the artifacts are there they are not quite as distracting. I won’t go into the details of the artifacts introduced with SSR here, but for those interested, here is a good discussion. I should mention that my take on this is fairly basic and doesn’t implement relevant features such as the Hierarchical Z Buffer optimization (HZB) discussed here. I only implemented support for SSR in the deferred path, since like in the case of SSAO (and more generally all screen-space algorithms), deferred rendering is the best match since we are already capturing screen-space information in the GBuffer. The first stage for this requires to have means to identify fragments that need reflection information. In our case, the floor fragments. What I did for this is to capture the reflectiveness of the material of each fragment in the screen during the GBuffer pass. This is a single floating-point component (in the 0-1 range). A value of 0 means that the material is not reflective and the SSR pass will just ignore it. A value of 1 means that the fragment is 100% reflective, so its color value will be solely the reflection color. Values in between allow us to control the strength of the reflection for each fragment with a reflective material in the scene. One small note on the GBuffer storage: because this is a single floating-point value, we don’t necessarily need an extra attachment in the GBuffer (which would have some performance penalty), instead we can just put this in the alpha component of the diffuse color, since we were not using it (the Intel Mesa driver doesn’t support rendering to RGB textures yet, so since we are limited to RGBA we might as well put it to good use). Besides capturing which fragments are reflective, we can also store another piece of information relevant to the reflection computations: the material’s roughness. This is another scalar value indicating how much blurring we want to apply to the resulting reflection: smooth metal-like surfaces can have very sharp reflections but with rougher materials that have not smooth surfaces we may want the reflections to look a bit blurry, to better represent these imperfections. Besides the reflection and roughness information, to capture screen-space reflections we will need access to the output of the previous pass (tone mapping) from which we will retrieve the color information of our reflection points, the normals that we stored in the GBuffer (to compute reflection directions for each fragment in the floor sections) and the depth buffer (from the depth-prepass), so we can check for reflection collisions. The technique goes like this: for each fragment that is reflective, we compute the direction of the reflection using its normal (from the GBuffer) and the view vector (from the camera and the fragment position). Once we have this direction, we execute a ray marching from the fragment position, in the direction of the reflection. For each point we generate, we take the screen-space X and Y coordinates and use them to retrieve the Z-buffer depth for that pixel in the scene. If the depth buffer value is smaller than our sample’s it means that we have moved past foreground geometry and we stop the process. If we got to this point, then we can do a binary search to pin-point the exact location where the collision with the foreground geometry happens, which will give us the screen-space X and Y coordinates of the reflection point. Once we have that we only need to sample the original scene (the output from the tone mapping pass) at that location to retrieve the reflection color. As discussed earlier, the technique has numerous caveats, which we need to address in one way or another and maybe adapt to the characteristics of different scenes so we can obtain the best results in each case. Naturally, the image above only shows reflection data for the pixels in the floor, since those are the only ones with a reflective material attached. It is immediately obvious that some pixels lack reflection color though, this is due to the various limitations of the screen-space technique that are discussed in the blog post I linked above. Because the reflections will be alpha-blended with the original image, we use the reflectiveness that we stored in the GBuffer as the base for the alpha component of the reflection color as well (there are other aspects that can contribute to the alpha component too, but I won’t go into that here), so the image above, although not visible in the screenshot, has a valid alpha channel. Once we have captured the reflection image, the next step is to apply the material roughness settings. We can accomplish this with a simple box filter based on the roughness of each fragment: the larger the roughness, the larger the box filter we apply and the blurrier the reflection we get as a result. Because we store roughness for each fragment in the GBuffer, we can have multiple reflective materials with different roughness settings if we want. In this case, we just have one material for the floor though. So far we have been neglecting anti-aliasing. Because we are doing deferred rendering Multi-Sample Anti-Aliasing (MSAA) is not an option: MSAA happens at rasterization time, which in a deferred renderer occurs before our lighting pass (specifically, when we generate the GBuffer), so it cannot account for the important effects that the lighting pass has on the resulting image, and therefore, on the eventual aliasing that we need to correct. This is why deferred renderers usually do anti-aliasing via post-processing. The image above shows the results of the anti-aliasing pass. Compare that with the output of the SSR pass. You can see how this pass has effectively removed the jaggies observed in the cloths hanging from the upper floor for example. Unlike MSAA, which acts on geometry edges only, FXAA works on all pixels, so it can also smooth out edges produced by shaders or textures. Whether that is something we want to do or not may depend on the scene. Here we can see this happening on the foreground column on the left, where some of the imperfections of the stone are slightly smoothed out by the FXAA pass. So that’s all, congratulations if you managed to read this far! In the past I have found articles that did frame analysis like this quite interesting so it’s been fun writing one myself and I only hope that this was interesting to someone else. This demo has been implemented in Vulkan and includes a number of configurable parameters that can be used to tweak performance and quality. The work-in-progress source code is available here, but beware that I have only tested this on Intel, since that is the only hardware I have available, so you may find issues if you run this on other GPUs. If that happens, let me know in the comments and I might be able to provide fixes at some point. For some time now I have been working on and off on a personal project with no other purpose than toying a bit with Vulkan and some rendering and shading techniques. Although I’ll probably write about that at some point, in this post I want to focus on Vulkan’s specialization constants and how they can provide a very visible performance boost when they are used properly, as I had the chance to verify while working on this project. 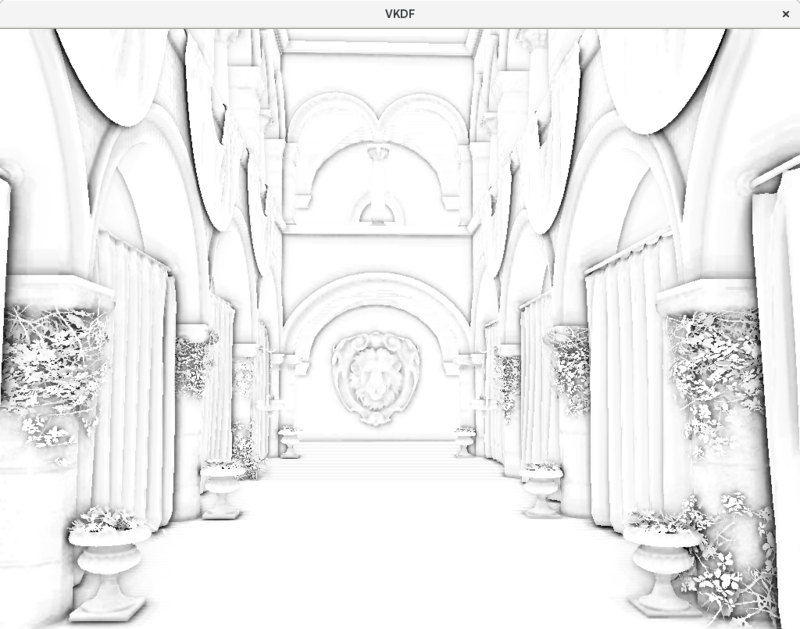 That is a snippet taken from a Screen Space Ambient Occlusion shader that I implemented in my project, a popular techinique used in a lot of games, so it represents a real case scenario. As we can see, the process involves a set of vector samples passed to the shader as a UBO that are processed for each fragment in a loop. We have made the maximum number of samples that the shader can use large enough to accomodate a high-quality scenario, but the actual number of samples used in a particular execution will be taken from a push constant uniform, so the application has the option to choose the quality / performance balance it wants to use. The first obvious issue we find with this implementation is that it is preventing loop unrolling to happen because the actual number of samples to use is unknown at shader compile time. At most, the compiler could guess that it can’t be more than 64, but that number of iterations would still be too large for Mesa to unroll the loop in any case. If the application is configured to only use 24 or 32 samples (the value of our push constant uniform at run-time) then that number of iterations would be small enough that Mesa would unroll the loop if that number was known at shader compile time, so in that scenario we would be losing the optimization just because we are using a push constant uniform instead of a constant for the sake of flexibility. The second issue, which might be less immediately obvious and yet is the most significant one, is the fact that if the shader compiler can tell that the size of the samples array is small enough, then it can promote the UBO array to a push constant. This means that each access to S.samples[i] turns from an expensive memory fetch to a direct register access for each sample. To put this in perspective, if we are rendering to a full HD target using 24 samples per fragment, it means that we would be saving ourselves from doing 1920x1080x24 memory reads per frame for a very visible performance gain. But again, we would be loosing this optimization because we decided to use a push constant uniform. Vulkan’s specialization constants allow us to get back these performance optmizations without sacrificing the flexibility we implemented in the shader. To do this, the API provides mechanisms to specify the values of the constants at run-time, but before the shader is compiled. The application code above sets up specialization constant information for shader consumption at run-time. This is done via an array of VkSpecializationMapEntry entries, each one determining where to fetch the constant value to use for each specialization constant declared in the shader for which we want to override its default value. In our case, we have a single specialization constant (with id 0), and we are taking its value (of integer type) from offset 0 of a buffer. In our case we only have one specialization constant, so our buffer is just the address of the variable holding the constant’s value (config.ssao.num_samples). When we create the Vulkan pipeline, we pass this specialization information using the pSpecializationInfo field of VkPipelineShaderStageCreateInfo. At that point, the driver will override the default value of the specialization constant with the value provided here before the shader code is optimized and native GPU code is generated, which allows the driver compiler backend to generate optimal code. It is important to remark that specialization takes place when we create the pipeline, since that is the only moment at which Vulkan drivers compile shaders. This makes specialization constants particularly useful when we know the value we want to use ahead of starting the rendering loop, for example when we are applying quality settings to shaders. However, If the value of the constant changes frequently, specialization constants are not useful, since they require expensive shader re-compiles every time we want to change their value, and we want to avoid that as much as possible in our rendering loop. Nevertheless, it it is possible to compile the same shader with different constant values in different pipelines, so even if a value changes often, so long as we have a finite number of combinations, we can generate optimized pipelines for each one ahead of the start of the redendering loop and just swap pipelines as needed while rendering. Specialization constants are a straight forward yet powerful way to gain control over how shader compilers optimize your code. In my particular pet project, applying specialization constants in a small number of shaders allowed me to benefit from loop unrolling and, most importantly, UBO promotion to push constants in the SSAO pass, obtaining performance improvements that ranged from 10% up to 20% depending on the configuration. Finally, although the above covered specialization constants from the point of view of Vulkan, this is really a feature of the SPIR-V language, so it is also available in OpenGL with the GL_ARB_gl_spirv extension, which is core since OpenGL 4.6. It was only a few weeks ago when I posted that the Intel Mesa driver had successfully passed the Khronos OpenGL 4.6 conformance on day one, and now I am very proud that we can announce the same for the Intel Mesa Vulkan 1.1 driver, the new Vulkan API version announced by the Khronos Group last week. Big thanks to Intel for making Linux a first-class citizen for graphics APIs, and specially to Jason Ekstrand, who did most of the Vulkan 1.1 enablement in the driver. At Igalia we are very proud of being a part of this: on the driver side, we have contributed the implementation of VK_KHR_16bit_storage, numerous bugfixes for issues raised by the Khronos Conformance Test Suite (CTS) and code reviews for some of the new Vulkan 1.1 features developed by Intel. On the CTS side, we have worked with other Khronos members in reviewing and testing additions to the test suite, identifying and providing fixes for issues in the tests as well as developing new tests. Finally, I’d like to highlight the strong industry adoption of Vulkan: as stated in the Khronos press release, various other hardware vendors have already implemented conformant Vulkan 1.1 drivers, we are also seeing major 3D engines adopting and supporting Vulkan and AAA games that have already shipped with Vulkan-powered graphics. There is no doubt that this is only the beginning and that we will be seeing a lot more of Vulkan in the coming years, so look forward to it! Khronos has recently announced the conformance program for OpenGL 4.6 and I am very happy to say that Intel has submitted successful conformance applications for various of its GPU models for the Mesa Linux driver. For specifics on the conformant hardware you can check the list of conformant OpenGL products at the Khronos webstite. Being conformant on day one, which the Intel Mesa Vulkan driver also obtained back in the day, is a significant achievement. Besides Intel Mesa, only NVIDIA managed to do this, which I think speaks of the amount of work and effort that one needs to put to achieve it. The days where Linux implementations lagged behind are long gone, we should all celebrate this and acknowledge the important efforts that companies like Intel have put into making this a reality. Over the last 8-9 months or so, I have been working together with some of my Igalian friends to keep the Intel drivers (for both OpenGL and Vulkan) conformant, so I am very proud that we have reached this milestone. Kudos to all my work mates who have worked with me on this, to our friends at Intel, who have been providing reviews for our patches, feedback and additional driver fixes, and to many other members in the Mesa community who have contributed to make this possible in one way or another. 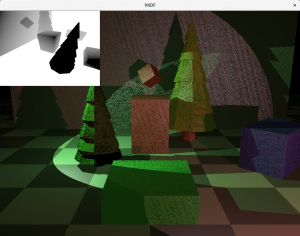 Of course, OpenGL 4.6 conformance requires that we have an implementation of GL_ARB_gl_spirv, which allows OpenGL applications to consume SPIR-V shaders. If you have been following Igalia’s work, you have already seen some of my colleagues sending patches for this over the last months, but the feature is not completely upstreamed yet. We are working hard on this, but the scope of the implementation that we want for upstream is rather ambitious, since it involves to (finally) have a full shader linker in NIR. Getting that to be as complete as the current GLSL linker and in a shape that is good enough for review and upstreaming is going to take some time, but it is surely a worthwhile effort that will pay off in the future, so please look forward to it and be patient with us as we upstream more of it in the coming months. It is also important to remark that OpenGL 4.6 conformance doesn’t just validate new features in OpenGL 4.6, it is a full conformance program for OpenGL drivers that includes OpenGL 4.6 functionality, and as such, it is a super set of the OpenGL 4.5 conformance. The OpenGL 4.6 CTS does, in fact, incorporate a whole lot of bugfixes and expanded coverage for OpenGL features that were already present in OpenGL 4.5 and prior. What is the conformance process and why is it important? It is a well known issue with standards that different implementations are not always consistent. This can happen for a number of reasons. For example, implementations have bugs which can make something work on one platform but not on another (which will then require applications to implement work arounds). Another reason for this is that some times implementators just have different interpretations of the standard. The Khronos conformance program is intended to ensure that products that implement Khronos standards (such as OpenGL or Vulkan drivers) do what they are supposed to do and they do it consistently across implementations from the same or different vendors. This is achieved by producing an extensive test suite, the Conformance Test Suite (or CTS for short), which aims to verify that the semantics of the standard are properly implemented by as many vendors as possible. Why is CTS different to other test suites available? One reason is that CTS development includes Khronos members who are involved in the definition of the API specifications. This means there are people well versed in the spec language who can review and provide feedback to test developers to ensure that the tests are good. Another reason is that before new tests go in, it is required that there are at least a number of implementation (from different vendors) that pass them. This means that various vendors have implemented the related specifications and these different implementations agree on the expected result, which is usually a good sign that the tests and the implementations are good (although this is not always enough!). How does CTS and the Khronos conformance process help API implementators and users? same no matter the driver you are running on. Now, this doesn’t mean that your application will run smoothly on all conformant platforms out of the box. Application developers still need to be aware that certain aspects or features in the specifications are optional, or that different hardware implementations may have different limits for certain things. Writing software that can run on multiple platforms is always a challenge and some of that will always need to be addressed on the application side, but at least the conformance process attempts to ensure that for applications that do their part of the work, things will work as intended. There is another interesting implication of conformance that has to do with correct API specification. Designing APIs that can work across hardware from different vendors is a challenging process. With the CTS, Khronos has an opportunity to validate the specifications against actual implementations. In other words, the CTS allows Khronos to verify that vendors can implement the specifications as intended and revisit the specification if they can’t before releasing them. This ensures that API specifications are reasonable and a good match for existing hardware implementations. Another benefit of CTS is that vendors working on any API implementation will always need some level of testing to verify their code during development. Without CTS, they would have to write their own tests (which would be biased towards their own interpretations of the spec anyway), but with CTS, they can leave that to Khronos and focus on the implementation instead, cutting down development times and sharing testing code with other vendors. What about Piglit or other testing frameworks? CTS doesn’t make Piglit obsolete or redundant at all. While CTS coverage will improve over the years it is nearly impossible to have 100% coverage, so having other testing frameworks around that can provide extra coverage is always good. My experience working on the Mesa drivers is that it is surprisingly easy to break stuff, specially on OpenGL which has a lot of legacy stuff in it. I have seen way too many instances of patches that seemed correct and in fact fixed actual problems only to later see Piglit, CTS and/or dEQP report regressions on existing tests. The (not so surprising) thing is that many times, the regressions were reported on just one of these testing frameworks, which means they all provide some level of coverage that is not included in the others. It is for this reason that the continuous integration system for Mesa provided by Intel runs all of these testing frameworks (and then some others). You just never get enough testing. And even then, some regressions slip into releases despite all the testing! Also, for the case of Piglit in particular, I have to say that it is very easy to write new tests, specially shader runner tests, which is always a bonus. Writing tests for CTS or dEQP, for example, requires more work in general. So what have I been doing exactly? For the last 9 months or so, I have been working on ensuring that the Intel Mesa drivers for both Vulkan and OpenGL are conformant. If you have followed any of my work in Mesa over the last year or so, you have probably already guessed this, since most of the patches I have been sending to Mesa reference the conformance tests they fix. Reviewing and testing patches submitted for inclusion in CTS that either fixed test bugs, extended coverage for existing features or added new tests for new API specifications. 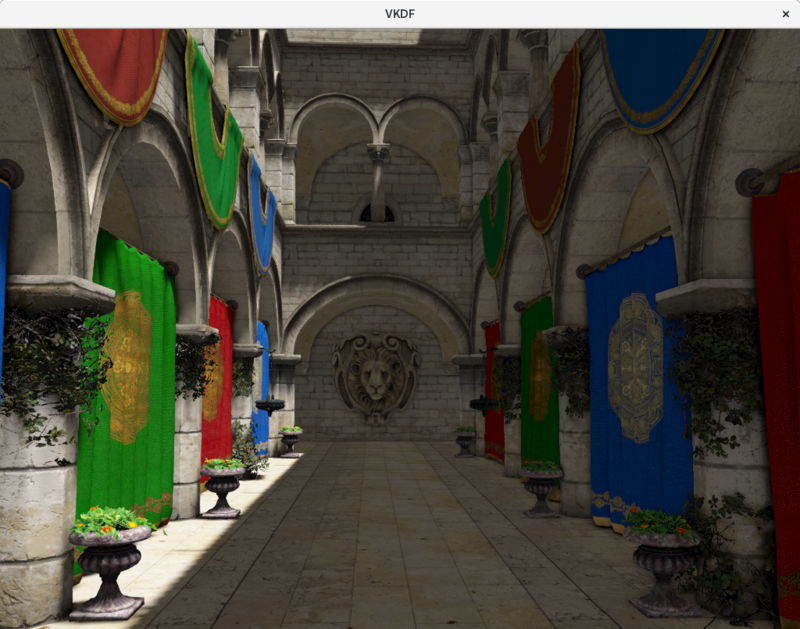 CTS is a fairly active project with numerous changes submitted for review pretty much every day, for OpenGL, OpenGL ES and Vulkan, so staying on top of things requires a significant dedication. Ensuring that the Intel Mesa drivers passed all the CTS tests for both Vulkan and OpenGL. This requires to run the conformance tests, identifying test failures, identifying the cause for the failures and providing proper fixes. The fixes would go to CTS when the cause for the issue was a bogus test, to the driver, when it was a bug in our implementation or the fact that the driver was simply missing some functionality, or they could even go to the OpenGL or Vulkan specs, when the source of the problem was incomplete, ambiguous or incorrect spec language that was used to drive the test development. I have found instances of all these situations. Where can I get the CTS code? Good news, it is open source and available at GitHub. This is a very important and welcomed change by Khronos. When I started helping Intel with OpenGL conformance, specifically for OpenGL 4.5, the CTS code was only available to specific Khronos members. Since then, Khronos has done a significant effort in working towards having an open source testing framework where anyone can contribute, so kudos to Khronos for doing this! Going open source not only leverages larger collaboration and further development of the CTS. 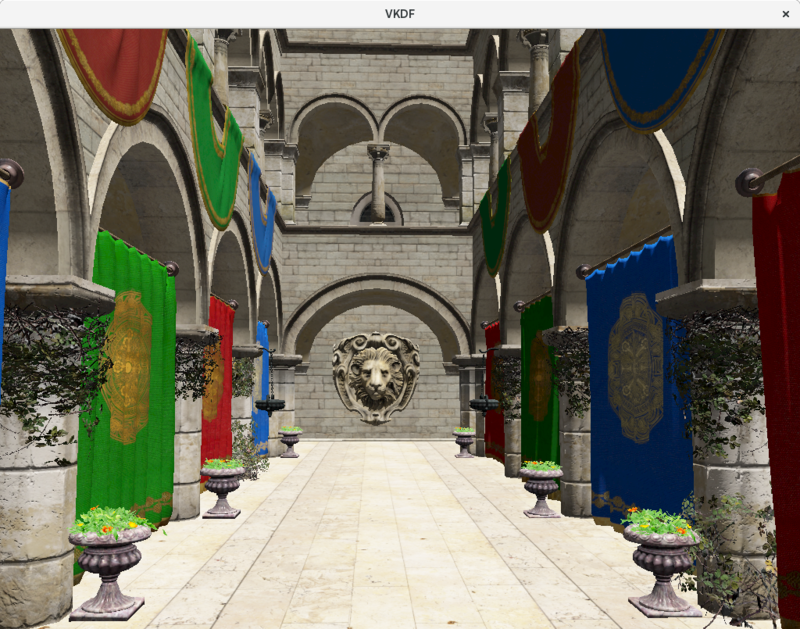 It also puts in the hands of API users a handful of small test samples that people can use to learn how some of the new Vulkan and OpenGL APIs released to the public are to be used, which is always nice. As I said above, CTS development is always ongoing, there is always testing coverage to expand for existing features, bugfixes to provide for existing tests, more tests that need to be adapted or changed to match corrections in in the spec language, new extensions and APIs that need testing coverage, etc. In this post, besides bringing the good news to everyone, I hope that I have made a good case for why the Khronos CTS is important for the industry and why we should care about it. I hope that I also managed to give a sense for the enormous amount of work that goes into making all of this possible, both on the side of Khronos and the side of the driver developer teams. I think all this effort means better drivers for everyone and I hope that we all, as users, come to appreciate it for that. Finally, big thanks to Intel for sponsoring our work on Mesa and CTS, and also to Igalia, for having me work on this wonderful project. OpenGL® and the oval logo are trademarks or registered trademarks of Silicon Graphics, Inc. in the United States and/or other countries worldwide. Additional license details are available on the SGI website. In the previous post in this series I introduced how to render the shadow map image, which is simply the depth information for the scene from the view point of the light. In this post I will cover how to use the shadow map to render shadows. The general idea is that for each fragment we produce we compute the light space position of the fragment. In this space, the Z component tells us the depth of the fragment from the perspective of the light source. The next step requires to compare this value with the shadow map value for that same X,Y position. If the fragment’s light space Z is larger than the value we read from the shadow map, then it means that this fragment is behind an object that is closer to the light and therefore we can say that it is in the shadows, otherwise we know it receives direct light. 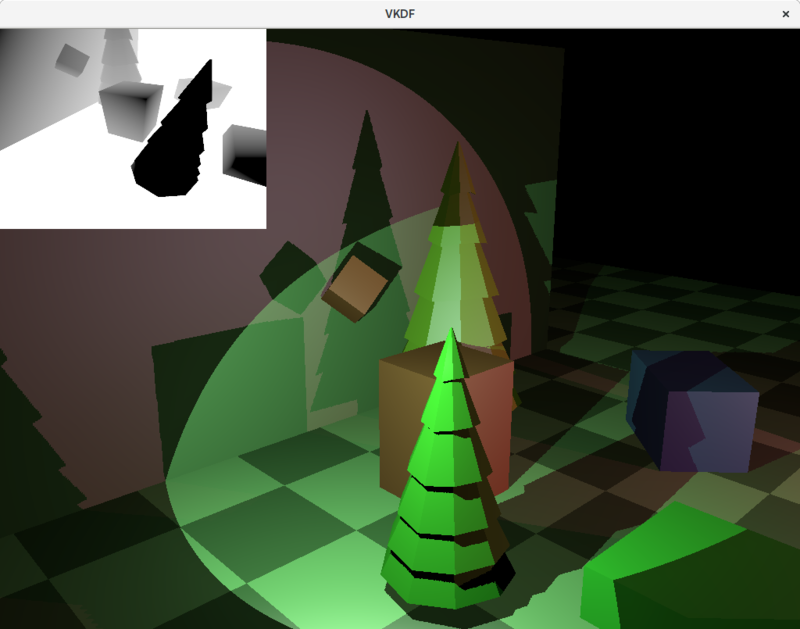 The vertex shader code above only shows the code relevant to the shadow mapping technique. Model is the model matrix with the spatial transforms for the vertex we are rendering, View and Projection represent the camera’s view and projection matrices and the LightViewProjection represents the product of the light’s view and projection matrices. 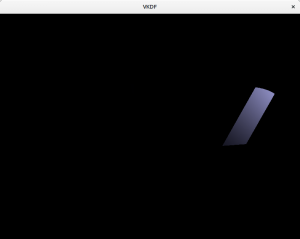 The variables prefixed with ‘out’ represent vertex shader outputs to the fragment shader. The code generates the world space position of the vertex (world_pos) and clip space position (gl_Position) as usual, but then also computes the light space position for the vertex (out_light_space_pos) by applying the View and Projection transforms of the light to the world position of the vertex, which gives us the position of the vertex in light space. 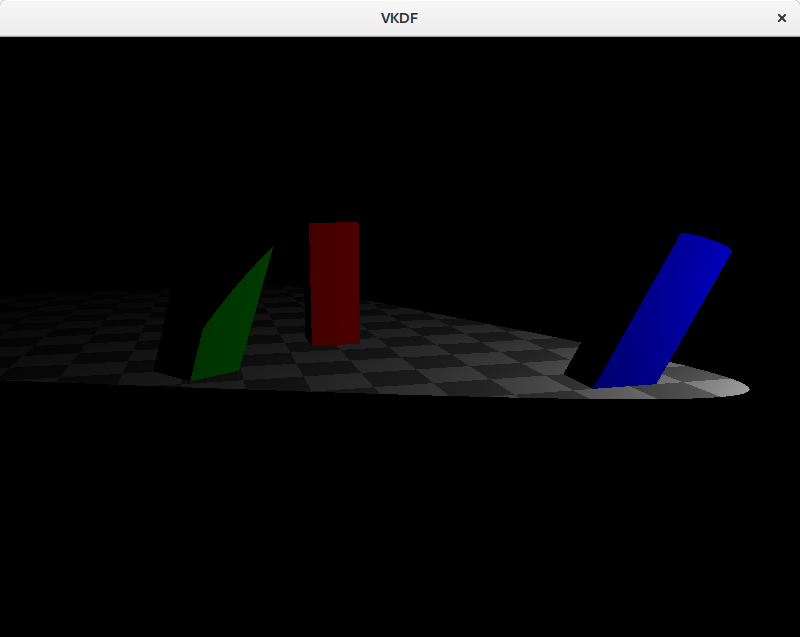 This will be used in the fragment shader to sample the shadow map. Apply perspective division to compute NDC coordinates from the interpolated light space position of the fragment. Notice that this process is slightly different between OpenGL and Vulkan, since Vulkan’s NDC Z is expected to be in the range [0, 1] instead of OpenGL’s [-1, 1]. Transform the X,Y coordinates from NDC space [-1, 1] to texture space [0, 1]. Sample the shadow map and compare the result with the light space Z position we computed for this fragment to decide if the fragment is shadowed. The function returns 0.0 if the fragment is in the shadows and 1.0 otherwise. Note that the function also avoids sampling the shadow map for fragments that are outside the light’s frustum (and therefore are not recorded in the shadow map texture): we know that any fragment in this situation is shadowed because it is obviously not visible from the light. This assumption is valid for spotlights and point lights because in these cases the shadow map captures the entire influence area of the light source, for directional lights that affect the entire scene however, we usually need to limit the light’s frustum to the surroundings of the camera, and in that case we probably want want to consider fragments outside the frustum as lighted instead. Now all that remains in the shader code is to use this factor to eliminate the diffuse and specular components for fragments that are in the shadows. To achieve this we can simply multiply these components by the factor computed by this function. The list of changes in the main program are straight forward: we only need to update the pipeline layout and descriptors to attach the new resources required by the shaders, specifically, the light’s view projection matrix in the vertex shader (which could be bound as a push constant buffer or a uniform buffer for example) and the shadow map sampler in the fragment shader. This creates the sampler object that we will use to sample the shadow map image. The address mode fields are not very relevant since our shader ensures that we do not attempt to sample outside the shadow map, we use linear filtering, but that is not mandatory of course, and we select nearest for the mipmap filter because we don’t have more than one miplevel in the shadow map. A combined image sampler brings together the texture image to sample from (a VkImageView of the image actually) and the description of the filtering we want to use to sample that image (a VkSampler). As with all descriptor sets, we need to indicate its binding point in the set (in our case it is 0 because we have a separate descriptor set layout for this that only contains one binding for the combined image sampler). 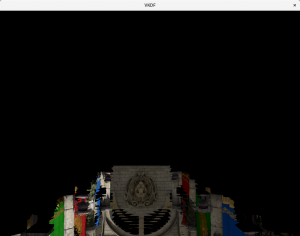 Notice that we need to specify the layout of the image when it will be sampled from the shaders, which needs to be VK_IMAGE_LAYOUT_SHADER_READ_ONLY_OPTIMAL. If you revisit the definition of our render pass for the shadow map image, you’ll see that we had it automatically transition the shadow map to this layout at the end of the render pass, so we know the shadow map image will be in this layout immediately after it has been rendered, so we don’t need to add barriers to execute the layout transition manually. So that’s it, with this we have all the pieces and our scene should be rendering shadows now. Unfortunately, we are not quite done yet, if you look at the results, you will notice a lot of dark noise in surfaces that are directly lit. This is an artifact of shadow mapping called self-shadowing or shadow acne. The next section explains how to get rid of it. However, due to different precession errors that can be generated on both sides of that equation, we may end up with slightly different values for each side and when the value we produce for light_space_ndc.z end ups being larger than what we read from the shadow map, even if it is a very small amount, it will mark the pixel as shadowed, leading to the result we see in that image. The usual way to fix this problem involves adding a small depth offset or bias to the depth values we store in the shadow map so we ensure that we always read a larger value from the shadow map for the fragment. Another way to think about this is to think that when we record the shadow map, we push every object in the scene slightly away from the light source. Unfortunately, this depth offset bias should not be a constant value, since the angle between the surface normals and the vectors from the light source to the fragments also affects the bias value that we should use to correct the self-shadowing. Where depthBiasConstantFactor is a constant factor that is automatically added to all depth values produced and depthBiasSlopeFactor is a factor that is used to compute depth offsets also based on the angle. This provides us with the means we need without having to do any extra work in the shaders ourselves to offset the depth values correctly. 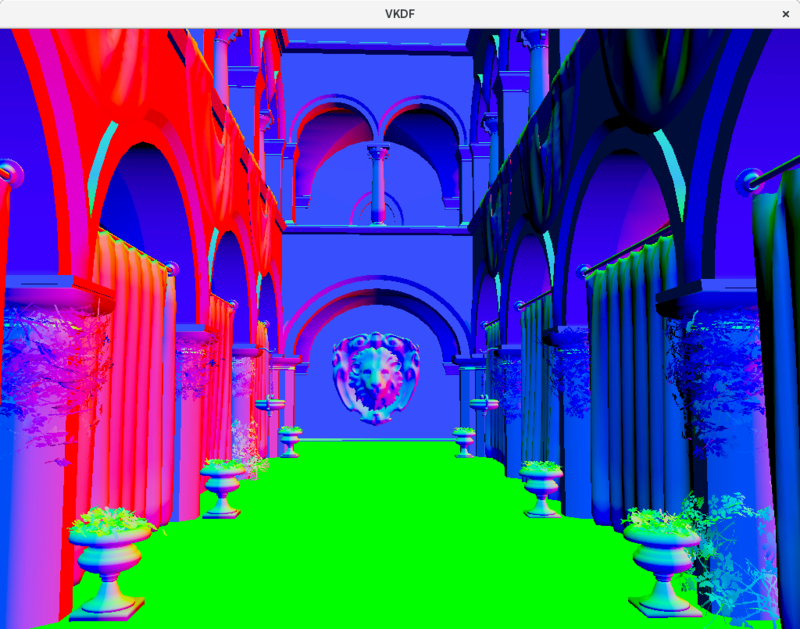 In OpenGL the same functionality is available via glPolygonOffset(). As we can see in the image, we no longer have self-shadowing, but now we have the opposite problem: the shadows casted by the red and blue blocks are visibly incorrect, as if they were being rendered further away from the light source than they should be. 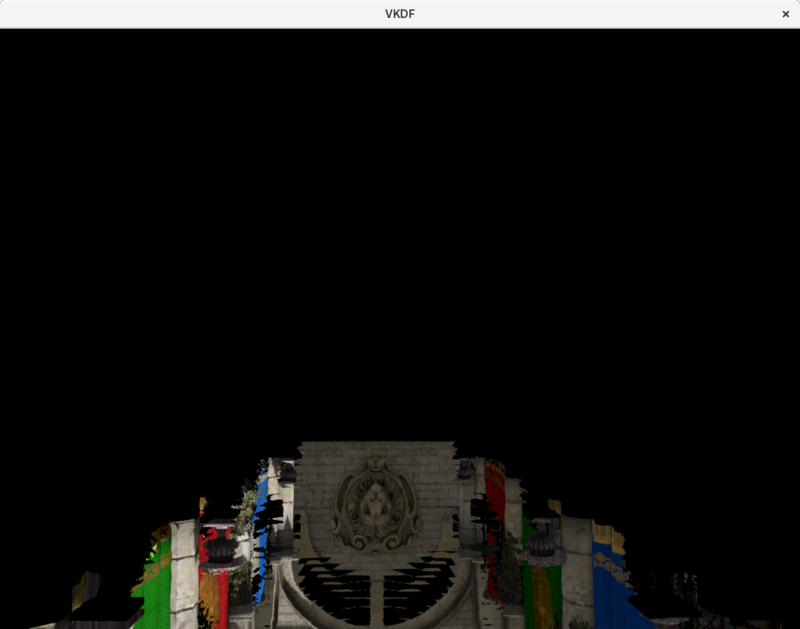 Another thing contributing to the aliasing effect is that a single pixel in the shadow map image can possibly expand to multiple pixels in camera space. That can happen if the camera is looking at an area of the scene that is close to the camera, but far away from the light source for example. In that case, the resolution of that area of the scene in the shadow map is small, but it is large for the camera, meaning that we end up sampling the same pixel from the shadow map to shadow larger areas in the scene as seen by the camera. Increasing the resolution of the shadow map image will help with this, but it is not a very scalable solution and can quickly become prohibitive. Alternatively, we can implement something called Percentage-Closer Filtering to produce antialiased shadows. The technique is simple: instead of sampling just one texel from the shadow map, we take multiple samples in its neighborhood and average the results to produce shadow factors that do not need to be exactly 1 o 0, but can be somewhere in between, producing smoother transitions for shadowed pixels on the shadow edges. The more samples we take, the smoother the shadows edges get but do note that extra samples per pixel also come with a performance cost. We now have a loop where we go through the samples in the neighborhood of the texel and average their respective shadow factors. Notice that because we sample the shadow map in texture space [0, 1], we need to consider the size of the shadow map image to properly compute the coordinates for the texels in the neighborhood so the application needs to provide this for every shadow map. In this post we discussed how to use the shadow map image to produce shadows in the scene as well as typical issues that can show up with the shadow mapping technique, such as self-shadowing and aliasing, and how to correct them. This will be the last post in this series, there is a lot more stuff to cover about lighting and shadowing, such as Cascaded Shadow Maps (which I introduced briefly in this other post), but I think (or I hope) that this series provides enough material to get anyone interested in the technique a reference for how to implement it. In the previous post we talked about the Phong lighting model as a means to represent light in a scene. Once we have light, we can think about implementing shadows, which are the parts of the scene that are not directly exposed to light sources. Shadow mapping is a well known technique used to render shadows in a scene from one or multiple light sources. In this post we will start discussing how to implement this, specifically, how to render the shadow map image, and the next post will cover how to use the shadow map to render shadows in the scene. 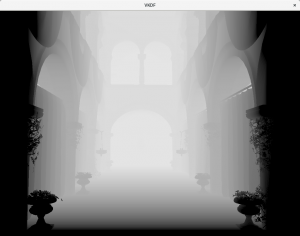 Note: although the code samples in this post are for Vulkan, it should be easy for the reader to replicate the implementation in OpenGL. Also, my OpenGL terrain renderer demo implements shadow mapping and can also be used as a source code reference for OpenGL. 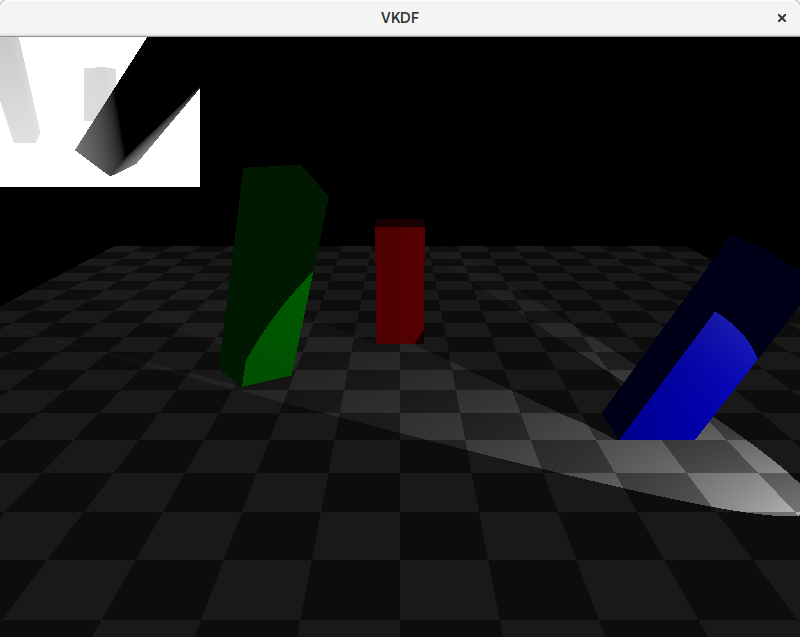 Shadow mapping involves two passes, the first pass renders the scene from te point of view of the light with depth testing enabled and records depth information for each fragment. 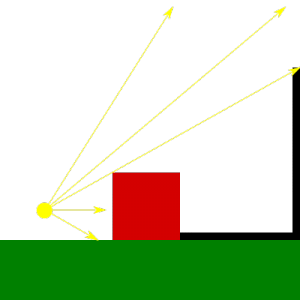 The resulting depth image (the shadow map) contains depth information for the fragments that are visible from the light source, and therefore, are occluders for any other fragment behind them from the point of view of the light. In other words, these represent the only fragments in the scene that receive direct light, every other fragment is in the shade. In the second pass we render the scene normally to the render target from the point of view of the camera, then for each fragment we need to compute the distance to the light source and compare it against the depth information recorded in the previous pass to decice if the fragment is behind a light occluder or not. If it is, then we remove the diffuse and specular components for the fragment, making it look shadowed. 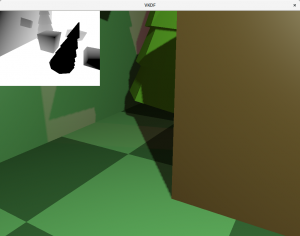 In this post I will cover the first pass: generation of the shadow map. 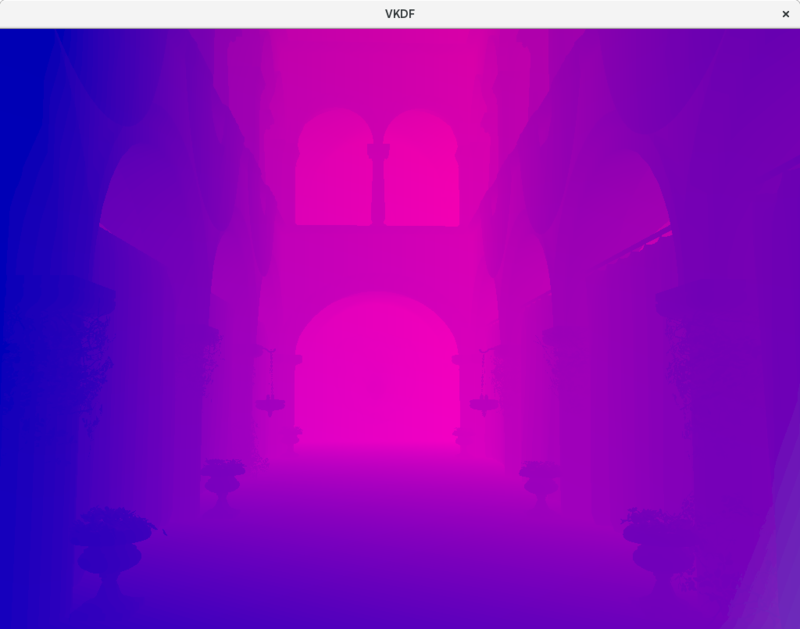 Note: those looking for OpenGL code can have a look at this file ter-shadow-renderer.cpp from my OpenGL terrain renderer demo, which contains the shadow map renderer that generates the shadow map for the sun light in that demo. The code above creates a 2D image with a 32-bit float depth format. The shadow map’s width and height determine the resolution of the depth image: larger sizes produce higher quality shadows but of course this comes with an additional computing cost, so you will probably need to balance quality and performance for your particular target. In the first pass of the algorithm we need to render to this depth image, so we include the VK_IMAGE_USAGE_DEPTH_STENCIL_ATTACHMENT_BIT usage flag, while in the second pass we will sample the shadow map from the fragment shader to decide if each fragment is in the shade or not, so we also include the VK_IMAGE_USAGE_SAMPLED_BIT. One more tip: when we allocate and bind memory for the image, we probably want to request device local memory too (VK_MEMORY_PROPERTY_DEVICE_LOCAL_BIT) for optimal performance, since we won’t need to map the shadow map memory in the host for anything. In order to generate the shadow map image we need to render the scene from the point of view of the light, so first, we need to compute the corresponding View and Projection matrices. How we calculate these matrices depends on the type of light we are using. As described in the previous post, we can consider 3 types of lights: spotlights, positional lights and directional lights. 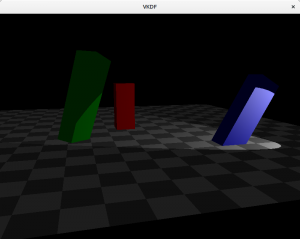 Spotlights are the easiest for shadow mapping, since with these we use regular perspective projection. Positional lights work similar to spotlights in the sense that they also use perspective projection, however, because these are omnidirectional, they see the entire scene around them. 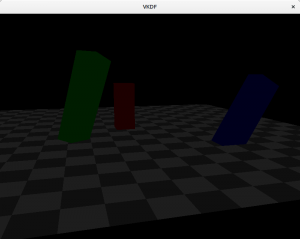 This means that we need to render a shadow map that contains scene objects in all directions around the light. We can do this by using a cube texture for the shadow map instead of a regular 2D texture and render the scene 6 times adjusting the View matrix to capture scene objects in front of the light, behind it, to its left, to its right, above and below. In this case we want to use a field of view of 45º with the projection matrix so that the set of 6 images captures the full scene around the light source with no image overlaps. Finally, we have directional lights. In the previous post I mentioned that these lights model light sources which rays are parallel and because of this feature they cast regular shadows (that is, shadows that are not perspective projected). Thus, to render shadow maps for directional lights we want to use orthographic projection instead of perspective projection. 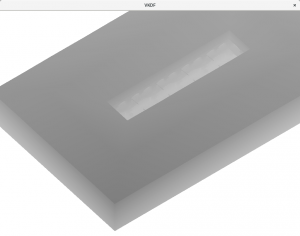 In this post I will focus on creating a shadow map for a spotlight source only. I might write follow up posts in the future covering other light sources, but for the time being, you can have a look at my OpenGL terrain renderer demo if you are interested in directional lights. The code above generates a regular perspective projection with a field of view of 45º. We should adjust the light’s near and far planes to make them as tight as possible to reduce artifacts when we use the shadow map to render the shadows in the scene (I will go deeper into this in a later post). 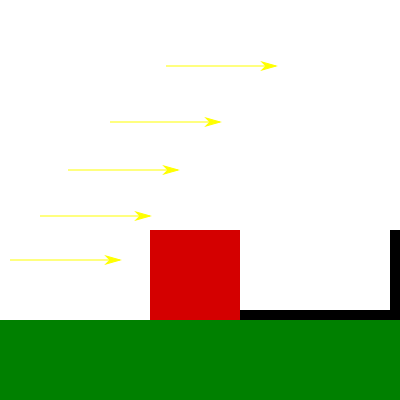 In order to do this we should consider that the near plane can be increased to reflect the closest that an object can be to the light (that might depend on the scene, of course) and the far plane can be decreased to match the light’s area of influence (determined by its attenuation factors, as explained in the previous post). The clip matrix is not specific to shadow mapping, it just makes it so that the resulting projection considers the particularities of how the Vulkan coordinate system is defined (Y axis is inversed, Z range is halved). Here, origin is the position of the light source in world space, and rot represents the rotation angles of the light source on each axis, representing the direction in which the spotlight is facing. The render pass is simple enough: we only have one attachment with the depth image and one subpass that renders to the shadow map target. We will start the render pass by clearing the shadow map and by the time we are done we want to store it and transition it to layout VK_IMAGE_LAYOUT_SHADER_READ_ONLY_OPTIMAL so we can sample from it later when we render the scene with shadows. Notice that because we only care about depth information, the render pass doesn’t include any color attachments. The code above defines a single vertex attribute for the position, but assumes that we read this from a vertex buffer that packs interleaved positions and normals for each vertex (each being a vec3) so we use the binding’s stride to jump over the normal values in the buffer. This is because in this particular example, we have a single vertex buffer that we reuse for both shadow map rendering and normal scene rendering (which requires vertex normals for lighting computations). 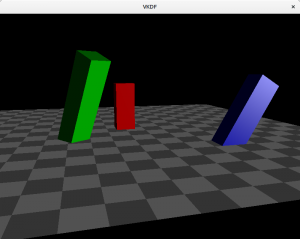 The shader takes the ViewProjection matrix of the light (we have already multiplied both together in the host) and a UBO with the Model matrices of each object in the scene as external resources (we use instanced rendering in this particular example) as well as a single vec3 input attribute with the vertex position. The only job of the vertex shader is to compute the position of the vertex in the transformed space (the light space, since we are passing the ViewProjection matrix of the light), nothing else is done here. 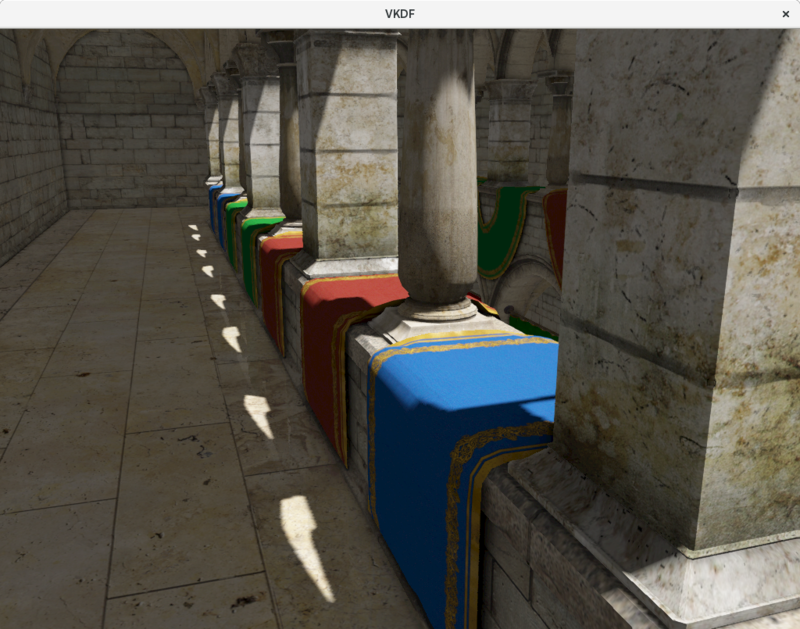 Next, we bind the shadow map pipeline we created above, bind the vertex buffer and descriptor sets as usual and draw the scene geometry. Notice that the shadow map pipeline layout will be different from the one used with the scene too. 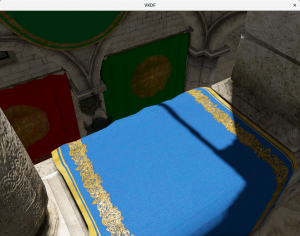 Specifically, during scene rendering we will at least need to bind the shadow map for sampling and we will probably also bind additional resources to access light information, surface materials, etc that we don’t need to render the shadow map, where we only need the View and Projection matrices of the light plus the UBO with the model matrices of the objects in the scene. Because the next pass of the algorithm will need to sample the shadow map during the final scene rendering,we use a semaphore to ensure that we complete this work before we start using it in the next pass of the algorithm. 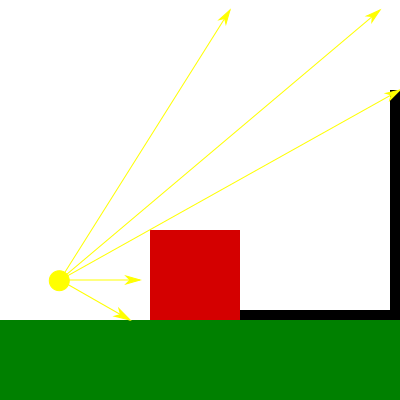 In most scenarios, we will want to render the shadow map on every frame to account for dynamic objects that move in the area of effect of the light or even moving lights, however, if we can ensure that no objects have altered their positions inside the area of effect of the light and that the light’s description (position/direction) hasn’t changed, we may not need need to regenerate the shadow map and save some precious rendering time. We can use the vertex and fragment shaders above to render the contents of the shadow map image on to a quad. The vertex shader takes the quad’s vertex positions and texture coordinates as attributes and passes them to the fragment shader, while the fragment shader samples the shadow map at the provided texture coordinates and then “linearizes” the depth value so that we can see better. The code in the shader doesn’t properly linearize the depth values we read from the shadow map (that requires to pass the Z-near and Z-far values used in the projection), but for debugging purposes this works well enough for me, if you use different Z clipping planes you may need to alter the ‘100.0’ value to get good results (or you might as well do a proper conversion considering your actual Z-near and Z-far values). 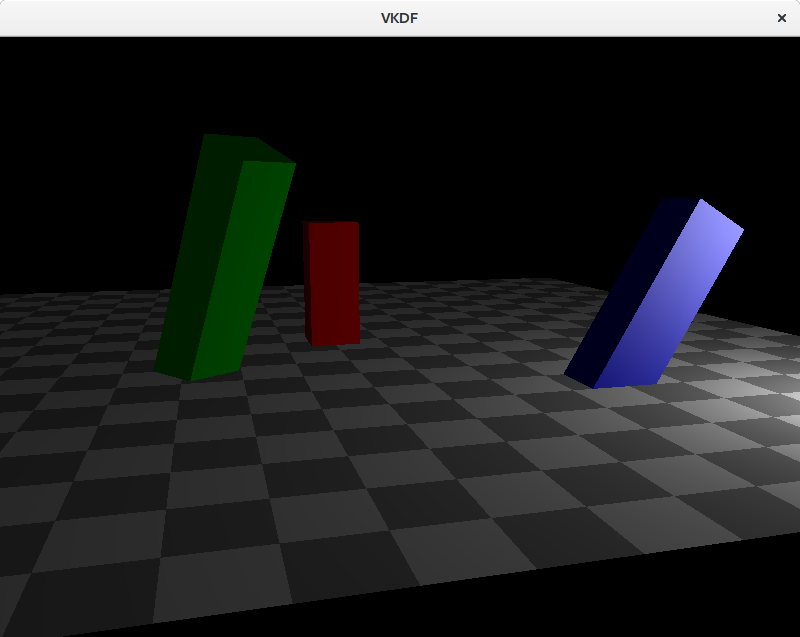 The image shows the shadow map on top of the scene. Darker colors represent smaller depth values, so these are fragments closer to the light source. Notice that we are not rendering the floor geometry to the shadow map since it can’t cast shadows on any other objects in the scene. In this post we have described the shadow mapping technique as a combination of two passes: the first pass renders a depth image (the shadow map) with the scene geometry from the point of view of the light source. To achieve this, we need a passthrough vertex shader that only transforms the scene vertex positions (using the view and projection transforms from the light) and we can skip the fragment shader completely since we do not care for color output. The second pass, which we will cover in the next post, takes the shadow map as input and uses it to render shadows in the final scene. 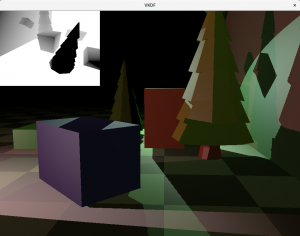 Some time ago I promised to write a bit more about how shadow mapping works. It has taken me a while to bring myself to actually deliver on that front, but I have finally decided to put together some posts on this topic, this being the first one. However, before we cover shadow mapping itself we need to cover some lighting basics first. After all, without light there can’t be shadows, right? In the real world, the light that reaches an object is a combination of both direct and indirect light. Direct light is that which comes straight from a light source, while indirect light is the result of light rays hitting other surfaces in the scene, bouncing off of them and eventually reaching the object as a result, maybe after multiple reflections from other objects. 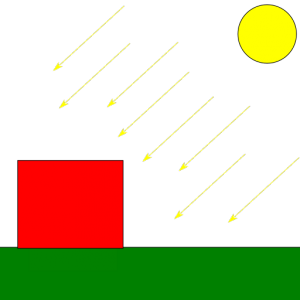 Because each time a ray of light hits a surface it loses part of its energy, indirect light reflection is less bright than direct light reflection and its color might have been altered. The contrast between surfaces that are directly hit by the light source and surfaces that only receive indirect light is what creates shadows. A shadow isn’t but the part of a scene that doesn’t receive direct light but might still receive some amount of (less intense) indirect light. When we study the behavior of light, we notice that the direction in which surfaces reflect incoming light affects our perception of the surface. For example, if we lit a shiny surface (such as a piece of metal) using a strong light shource so that incoming light is reflected off the surface in the exact opposite direction in which we are looking at it, we will see a strong reflection in the form of highlights. If we move around so that we look at the same surface from a different angle, then we will see the reflection get dimmer and the highlights will eventually disappear. In order to model this behavior we need to know the direction in which the surfaces we render reflect incoming light. 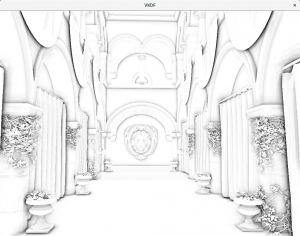 The way to do this is by associating vectors called normals with the surfaces we render so that shaders can use that information to produce lighting calculations akin to what we see in the natural world. Usually, modeling programs can compute normal vectors for us, even model loading libraries can do this work automatically, but some times, for example when we define vertex meshes programatically, we need to define them manually. I won’t covere here how to do this in the general, you can see this article from Khronos if you’re interested in specific algorithms, but I’ll point out something relevant: given a plane, we can compute normal vectors in two opposite directions, one is correct for the front face of the plane/polygon and the other one is correct for the back face, so make sure that if you compute normals manually, you use the correct direction for each face, otherwise you won’t be reflecting light in the correct direction and results won’t be as you expect. In most scenarios, we only render the front faces of the polygons (by enabling back face culling) and thus, we only care about one of the normal vectors (the one for the front face). Another thing to notice about normal vectors is that they need to be transformed with the model to be correct for transformed models: if we rotate a model we need to rotate the normals too, since the faces they represent are now rotated and thus, their normal directions have rotated too. Scaling also affects normals, specifically if we don’t use regular scaling, since in that case the orientation of the surfaces may change and affect the direction of the normal vector. 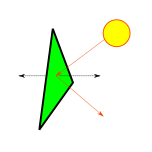 Because normal vectors represent directions, their position in world space is irrelevant, so for the purpose of lighting calculations, a normal vector such as (1, 0, 0) defined for a surface placed at (0, 0, 0) is still valid to represent the same surface at any other position in the world; in other words, we do not need to apply translation transforms to our normal vectors. Notice that the code above normalizes the resulting normal before it is fed to the fragment shader. This is important because the rasterizer will compute normals for all fragments in the surface automatically, and for that it will interpolate between the normals for each vertex we emit. For the interpolated normals to be correct, all vertex normals we output in the vertex shader must have the same length, otherwise the larger normals will deviate the direction of the interpolated vectors towards them because their larger size will increase their weight in the interpolation computations. Finally, even if we emit normalized vectors in the vertex shader stage, we should note that the interpolated vectors that arrive to the fragment shader are not guaranteed to be normalized. Think for example of the normal vectors (1, 0, 0) and (0, 1, 0) being assigned to the two vertices in a line primitive. At the half-way point in between these two vertices, the interpolator will compute a normal vector of (0.5, 0.5, 0), which is not unit-sized. This means that in the general case, input normals in the fragment shader will need to be normalized again even if have normalized vertex normals at the vertex shader stage. Basically, we multiply the diffuse component of the incoming light with the diffuse reflection of the fragment’s material to produce the diffuse component of the light reflected by the fragment. 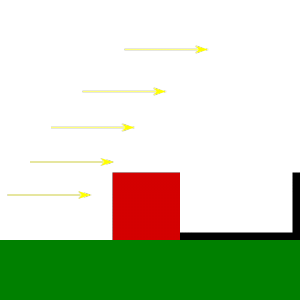 The diffuse component of the surface tells how the object absorbs and reflects incoming light. For example, a pure yellow object (diffuse material vec3(1,1,0)) would absorb the blue component and reflect 100% of the red and green components of the incoming light. If the light is a pure white light (diffuse vec3(1,1,1)), then the observer would see a yellow object. 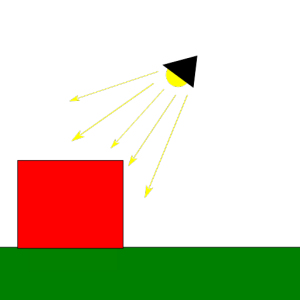 However, if we are using a red light instead (diffuse vec3(1,0,0)), then the light reflected from the surface of the object would only contain the red component (since the light isn’t emitting a green component at all) and we would see it red. As we said before though, the intensity of the reflection depends on the angle between the incoming light and the direction of the reflection. We account for this with the dot product between the normal at the fragment (surface_normal) and the direction of the light (or rather, the vector pointing from the fragment to the light source). Notice that because the vectors that we use to compute the dot product are normalized, dp_reflection is exactly the cosine of the angle between these two vectors. At an angle of 0º the surface is facing straight at the light source, and the intensity of the diffuse reflection is at its peak, since cosine(0º)=1. At an angle of 90º (or larger) the cosine will be 0 or smaller and will be clamped to 0, meaning that no light is effectively being reflected by the surface (the computed diffuse component will be 0). Computing all possible reflections and bounces of all rays of light from each light source in a scene is way too expensive. Instead, the Phong model approximates this by making indirect reflection from a light source constant across the scene. In other words: it assumes that the amount of indirect light received by any surface in the scene is the same. This eliminates all the complexity while still producing reasonable results in most scenarios. We call this constant factor ambient light. Very sharp, smooth surfaces such as metal are known to produce specular highlights, which are those bright spots that we can see on shiny objects. 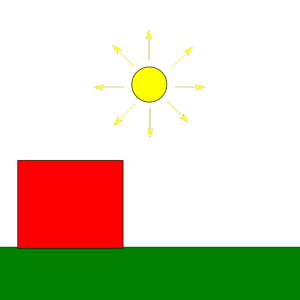 Specular reflection depends on the angle between the observer’s view direction and the direction in which the light is reflected off the surface. 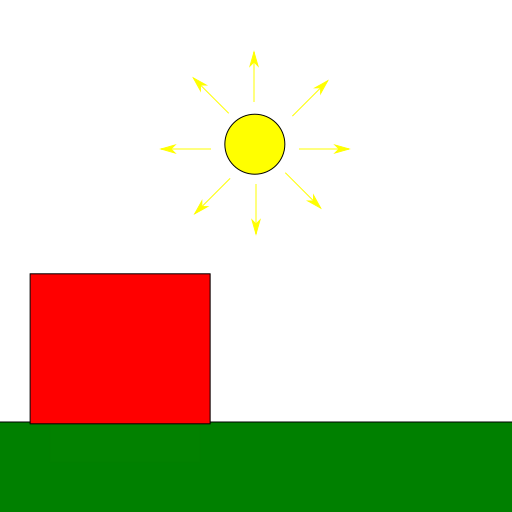 Specifically, the specular reflection is strongest when the observer is facing exactly in the opposite direction in which the light is reflected. Depending on the properties of the surface, the specular reflection can be more or less focused, affecting how the specular component scatters after being reflected. This property of the material is usually referred to as its shininess. The code above takes advantage of the fact that camera transformations are an illusion created by applying the transforms to everything else we render. For example, if we want to create the illusion that the camera is moving to the right, we just apply a translation to everything we render so they show up a bit to the left. This is what our View matrix achieves. From the point of view of GL or Vulkan, the camera is always fixed at (0,0,0). Taking advantage of this, we can compute the position of the virtual observer (the camera) in world space coordinates by applying the inverse of our camera transform to its fixed location (0,0,0). This is what the code above does, where world_pos is the position of this vertex in world space and View is the camera’s view matrix. Of course, we may decide not to apply attenuation to the ambient component at all if we really want to make it look like it is constant across the scene, however, do notice that when multiple light sources are present, the ambient factors from each source will accumulate and may produce too much ambient light unless they are attenuated. These are light sources that emit rays that travel along a specific direction so that all are parallel to each other. We typically use this model to represent bright, distant light sources that produce constant light across the scene. An example would be the sun light. Because the distance to the light source is so large compared to distances in the scene, the attenuation factor is irrelevant and can be discarded. Another particularity of directional light sources is that because the light rays are parallel, shadows casted from them are regular (we will talk more about this once we cover shadow mapping in future posts). Notice how the brightness of the scene doesn’t lower with the distance to the light source. These are light sources for which light originates at a specific position and spreads outwards in all directions. Shadows casted by point lights are not regular, instead they are projected. An example would be the light produced by a light bulb. The attenuation code I showed above would be appropriate to represent point lights. In this case, we can see how attenuation plays a factor and brightness lowers as we walk away from the light source (which is close to the blue cuboid). This is the light source I used to illustrate the diffuse, ambient and specular components. They are similar to point lights, is the sense that light originates from a specific point in space and spreads outwards, however, instead of scattering in all directions, rays scatter forming a cone with the tip at the origin of the light. The angle formed by the lights’s direction and the sides of the cone is usually called the cutoff angle, because not light is casted outside its limits. Flashlights are a good example of this type of light. In the code above we compute the cosine of the angle between the light’s direction and the vector from the light to the fragment (dp). Here, light.cutoff represents the cosine of the spotlight’s cutoff angle too, so when dp is smaller it means that the fragment is outside the light cone emitted by the spotlight and we remove its diffuse and specular reflections completely. Of course, light attenuation plays a vital role here to limit the area of influence of each light so that scenes where we have multiple lights don’t get too bright. An important thing to notice above the pseudocode above is that this process involves looping through costy per-fragment light computations for each light source, which can lead to important performance hits as the number of lights in the scene increases. 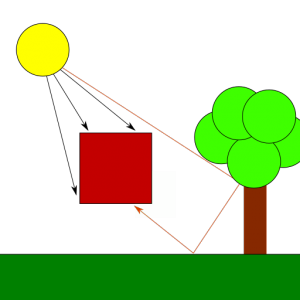 This shading model, as described here, is called forward rendering and it has the benefit that it is very simple to implement but its downside is that we may incur in many costy lighting computations for fragments that, eventually, won’t be visible in the screen (due to them being occluded by other fragments). This is particularly important when the number of lights in the scene is quite large and its complexity makes it so that there are many occluded fragments. Another technique that may be more suitable for these situations is called deferred rendering, which postpones costy shader computations to a later stage (hence the word deferred) in which we only evaluate them for fragments that are known to be visible, but that is a topic for another day, in this series we will focus on forward rendering only. For the purpose of shadow mapping in particular we should note that objects that are directly lit by the light source reflect all 3 of the light components, while objects in the shadow only reflect the ambient component. Because objects that only reflect ambient light are less bright, they appear shadowed, in similar fashion as they would in the real world. We will see the details how this is done in the next post, but for the time being, keep this in mind. The scene images in this post were obtained from a simple shadow mapping demo I wrote in Vulkan. The source code for that is available here, and it includes also the shadow mapping implementation that I’ll cover in the next post. 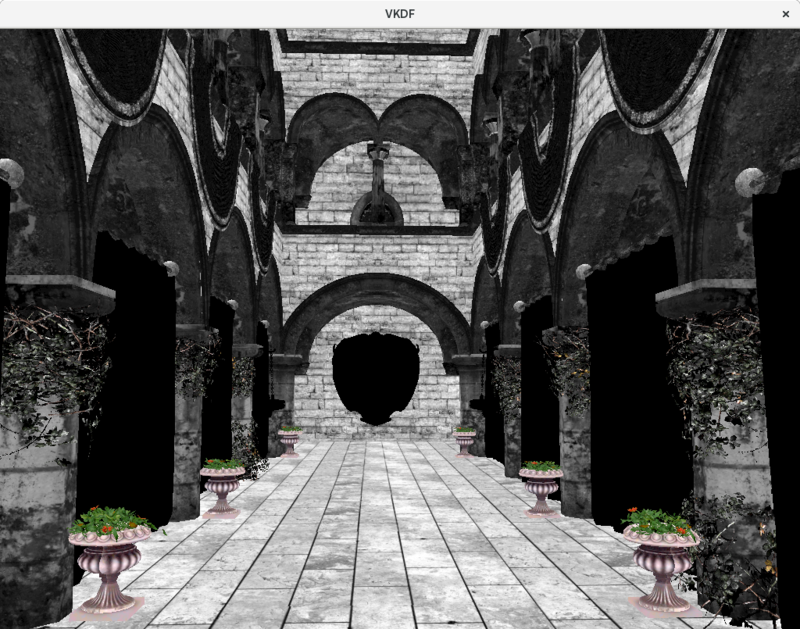 Specifically relevant to this post are the scene vertex and fragment shaders where lighting calculations take place. In order to represent shadows we first need a means to represent light. In this post we discussed the Phong reflection model as a simple, yet effective way to model light reflection in a scene as the addition of three separate components: diffuse, ambient and specular. Once we have a representation of light we can start discussing shadows, which are parts of the scene that only receive ambient light because other objects occlude the diffuse and specular components of the light source. 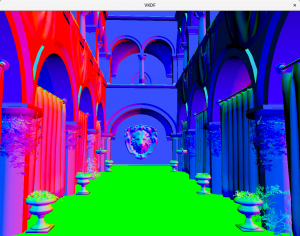 GL_ARB_gpu_shader_fp64 / OpenGL 4.0 lands for Intel/Haswell. More gen7 support coming soon! 2017 starts with good news for Intel Haswell users: it has been a long time coming, but we have finally landed GL_ARB_gpu_shader_fp64 for this platform. Thanks to Matt Turner for reviewing the huge patch series! Maybe you are not particularly excited about GL_ARB_gpu_shader_fp64, but that does not mean this is not an exciting milestone for you if you have a Haswell GPU (or even IvyBridge, read below): this extension was the last piece missing to finally bring Haswell to expose OpenGL 4.0! If you want to give it a try but you don’t want to build the driver from the latest Mesa sources, don’t worry: the feature freeze for the Mesa 13.1 release is planned to happen in just a few days and the current plan is to have the release in early February, so if things go according to plan you won’t have to wait too long for an official release. But that is not all, now that we have landed Fp64 we can also send for review the implementation of GL_ARB_vertex_attrib_64bit. This could be a very exciting milestone, since I believe this is the only thing missing for Haswell to have all the extensions required for OpenGL 4.5! You might be wondering about IvyBridge too, and 2017 also starts with good news for IvyBridge users. 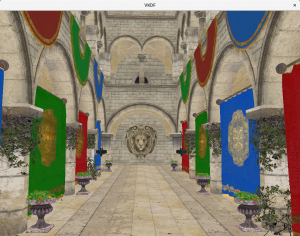 Landing Fp64 for Haswell allowed us to send for review the IvyBridge patches we had queued up for GL_ARB_gpu_shader_fp64 which will bring IvyBridge up to OpenGL 4.0. But again, that is not all, once we land Fp64 we should also be able to send the patches for GL_vertex_attrib_64bit and get IvyBridge up to OpenGL 4.2, so look forward to this in the near future! We have been working hard on Fp64 and Va64 during a good part of 2016, first for Broadwell and later platforms and later for Haswell and IvyBridge; it has been a lot of work so it is exciting to see all this getting to the last stages and on its way to the hands of the final users. All this has only been possible thanks to Intel’s sponsoring and the great support and insight that our friends there have provided throughout the development and review processes, so big thanks to all of them and also to the team at Igalia that has been involved in the development with me.